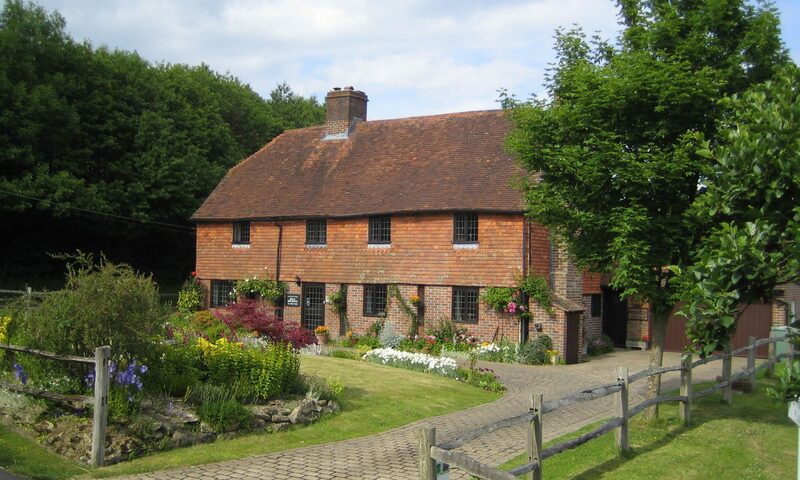 The cottage was built in the sixteen century, is Grade Two Listed and typical of the Kentish Weald. Originally the walls were made of timber, and wattle & daub but are now of brick with hung tiles on the first floor and roof. Once a yeoman farmhouse it has been divided into two and three dwellings but returned to one in the early 1970s with many sympathetic adaptations for today’s living while retaining the essential character with a wealth of exposed beams and inglenook fireplaces and leaded light windows. The twin bedded ground floor bedroom does have a step from the entrance door but is suitable for the less able but not ideal for wheelchair access or those with severe mobility impairment. As a very small business, we are able to provide a personal service and have long experience of people using wheelchairs and are happy to discuss our guest’s needs. At the end of a quiet lane and surrounded by Kentish apple orchards the cottage is the ideal location for a relaxing break with outstanding views of the Weald. You may contact us by post, by telephone (+44  1892 722483) or email: stay@honontoncottage.co.uk and view the accommodation and location on this website. The in out drive is level and can take up to six cars and built of cobbled concrete. This continues to both the front and side doors making wheelchair access relatively smooth. Being at the end of a farm lane there are no streetlights but we have several external lights to illuminate the driveway. The nearest bus stop is 1.5 miles away and the service very infrequent. Paddock Wood train station is 3 miles away, has a taxi rank and excellent services to central London as well as the Channel Port and Tunnel. Our guests are always greeted on arrival and escorted to their room where all the facilities are explained. Assistance is given with luggage and guests are given their own room and exterior door key. The front and side doors are both 81cm wide have a step of 10cm and have standard Yale type locks. Although on one level there is a 10cm step between the Guest Lounge and Dining Room and the bedroom is off this room, The dining table is a communal refectory table with extending end, which means a wheelchair can get close or under it. The twin bedded Willowpit Room has its own entrance, is double aspect, has a two-seater sofa with arms and a small fridge as well as TV with Freeview, radio/CD player with a selection of discs, hospitality tray and kettle. The en suite bathroom has a standard bath with handgrips and an electric shower over. There are two, 2 metre single beds, which will combine into a true double. This is accessed by a staircase of 12 treads, each of 20cm and 70cm wide and has a handrail on the right hand side. The Furnace Pond Room is also double aspect and has a super king size double bed and en suite shower room. Two armchairs are provided as well as TV with Freeview, radio/CD with a selection of discs, hospitality tray and kettle. Seating with arms and tables are placed in both front and back garden for guests use and to enjoy the well planted borders and outstanding views. Where possible we use local produce and support our local shops and Farmers Markets and we endeavour to cater for all dietary needs but please discuss in advance. There is local water and apple juice in the bedrooms. We welcome registered assistance dogs when advised in advance but allow no other pets on the premises. We rigorously enforce a non-smoking ban and do not normally accept children under the age of sixteen years. There are audible smoke and heat alarms throughout the cottage and we ask any guests who are hard of hearing to notify us so that we can make additional arrangements. All bedrooms have emergency buttons to summon assistance. Mobile phone reception is reasonable particularly Vodaphone and T Mobile. Wifi and Internet access are available on request. We can provide printed material in large print format. As a small concern, we endeavour to meet all our guests’ needs but the cottage is not manned throughout the day and we are unable to provide specialist care. If you have any concerns or queries, please don’t hesitate to contact us to discuss them.